Cadence is committed to creating a sustainable pool of talented electronic design automation (EDA) engineering students, preparing them with the tools and training they need to thrive in the competitive semiconductor and electronics industry. 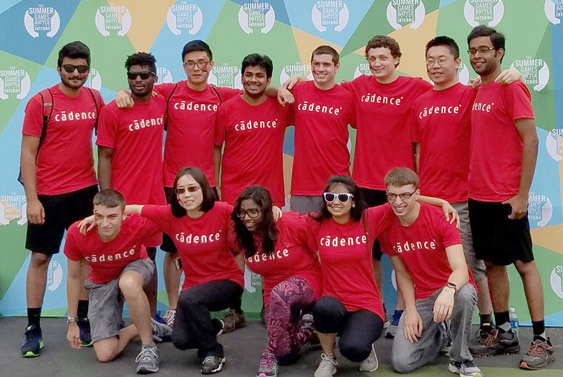 Cadence is recognized as a Great Place to Work around the world, including on FORTUNE Magazine's list of 100 Best Companies for the second consecutive year and a best workplace for recent college graduates. Visit our Careers Page and learn more about our open positions. Our internship program provides interns with hands-on experience working on the latest technology and customer challenges. As a part of our internship program, our hiring managers and interns develop a mentor/mentee relationship. Despite the learning curve, the internship program provides an environment for both the manager and student to grow and develop their skills. We want to build a channel where our managers can help recent college graduates launch their careers at Cadence, and where they can follow their passion and contribute to our innovation in a meaningful way. Having hired more than two hundred interns in the last year, our internship program has provided an environment for interns to grow, both personally and professionally, and the opportunity to apply what they’ve learned as they work on exciting leading-edge projects. A summer intern in San Jose says “Everything, right from the onboarding process to now, has been great. Cadence cares for their employees and I have an awesome manager who gives valuable feedback." As we regularly welcome this next generation of interns and recent graduates into Cadence, our College Hires and Internships Programs (CHIPs) team organizes fun networking events throughout the year to continue the positive momentum. These networking events allow Cadence’s recently hired graduates and interns to stay connected and mingle across the various business functions. What does it take to be an Ambassador? Ambassadors must have completed an internship at Cadence or received the "Women in Technology" scholarship. As such, they are self-starters with high aspirations and a desire to make an impact. They eat innovation for breakfast, are knowledgeable about Cadence technology (or willing to learn! ), and are enthusiastically involved in their school communities. All majors are welcome! Student ambassadors should be enrolled in undergraduate or post-graduate study, and be passionate about connecting with Cadence. We offer the Cadence Student Ambassador Program in multiple regions around the world. The Cadence Student Ambassador program consists of students Cadence has met over the years through a mutual passion for technology and innovation, and is currently by nomination or reference only. If you are working with a professor of the Cadence Academic Network, he or she might refer you! For further information please contact the Cadence Academic Network.